While at Wizard World this year I picked up some pretty random trades to review. This one is definitely on the more obscure side to me. I know of David Lloyd from his work on V For Vendetta. However this is the first book I have read where Lloyd writes and draws the book. Kickback has a very interesting premise. It is about a police force that has made a deal with the local crime element that for a collective price they will look the other way on small crimes as long as the crime element doesn’t go big with their crime. So far the deal has lowered the crime rate in the city, but it is clearly an uneasy balance. Then someone pulls a hit on a room full of cops, an event that threatens to destroy the alliance and throw the city into a violent turf war. Sadly the full product doesn’t live up to the great idea for the book. The story was hard to follow and I couldn’t tell you the name of any of the major characters, and there is a back up story to do with weird dreams that never really seemed relevant to the story as a whole. In fact I have read through it a couple of times and still haven’t figured out who carried out the hit on the police and what their motivations were. 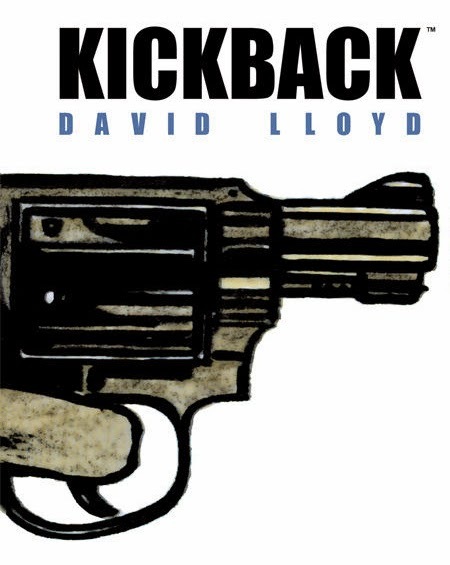 The art on Kickback is where the book shines. Lloyd has a great style for the noir feel the book was going for. Even if most of the police officers look the same. I really enjoyed the atmosphere that the art was creating for the book. The art may have been really good, but even that couldn’t save the mess that was a story that was difficult to follow. I really wanted to like this book, but it just didn’t deliver. Thanks for reading fellow fans. If you have any questions, comments or suggestions feel free to leave them in the comment section. And as always, keep reading comics fans.